Since the Sindhi community no longer has its state of Sindh, as a part of India, the closest association to a Tirath spot, had to be found. A land with such religious, sentimental and practical significance where the Sindhi community can perform their religious duties and where we could preserve the various aspects of Sindhi culture. Every community / cult / religion around the world has a Tirath place, for example, Vaishnodevi Temple in North India, Tirupati Temple in South India, Golden Temple of Sikhs, Jerusalem of Christianity, Mecca of Islam, Parthenon of the Greeks, etc. Jhulelal Tirathdham is this tirath dham (holy place) for all Sindhis. 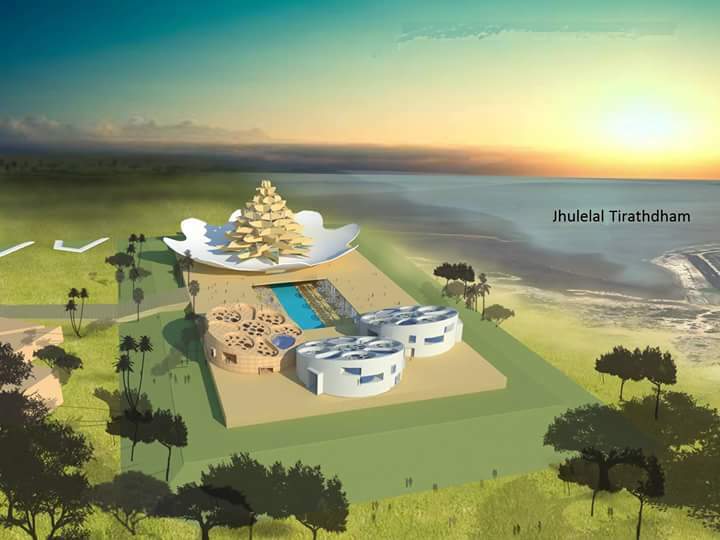 It is being built in an area that is regarded as one of the holiest in India. Amongst various other things, this area also has a very high Sindhi language speaking population, has proximity to Sindh, and is a place where the “Sindhu nadi”, or the river of Sindh (Indus river) used to end, once upon a time. The area where the Indus river used to end – for centuries, definitely has a mamoth significance to the community that worships the Sea God (Jhulelal) of this river. This place is the perfect place to create a true Tirathdham for all Sindhi’s to offer prayers, strengthen their beliefs and be united as one prosperous community as they once used to be! Jai Jhulelal. Good to know that that Sindhis will have a heritage built up in India. Jiye Sindhi. Jiye Sindhiyat. An excellent work. I wish you all the best for your project. Yes there must be our tirath dham we support ji ye sind ji ye sindhi. Jhulelal Tirth Dham will become ” Sindh” for those Sindies who left Sindh and settled at India, and for those Sindies also who born in India. Will be wonderful religious place to visit, the authorities building the Tirthdham should also build Dharamshal for visitor to stay for few days.